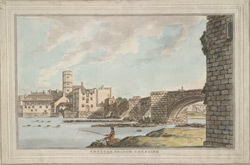 Watercolour showing part of the Chester Bridge, over the River Dee. The Dee Bridge dates from the late 14th century. It has seven irregular arches, some of which are pointed and some segmental. It connects Hanbridge and Bridge Street. Behind it is the town water tower and the Dee Mill.